Fair Trade and migration: Where is the link? As previously communicated to you by email, this is a crucial year for the future governance of WFTO-Europe, since we are going to recruit 4 new board members by the end of the year. 21st of June 2017 (online meeting from 3 to 5 pm; Brussels time). Due to our legal requirements to approve some financial documents (Accounts 2016/Budget 2018,…) in the first 6 months of the year, we are organising for the first time ever an online AGM in June dedicated mainly to the approval of these documents. We will do it via “gotomeeting” platform. You will only need to ensure to have a good connection at that time and to follow our “gotomeeting” instructions to attend the meeting. As you are aware your participation is fundamental to ensure the quorum and consequently the validity of the AGM. Therefore please pencil this date on your diary and free this time to meet us virtually. The main aim of having this double meeting is to enable us to comply with our legal requirements while keeping the meeting in Delhi as the main physical meeting. This last one will be focused on the presentation of the candidates and the final approval of the new Directors, in order to guarantee the secret ballot on the voting procedures as well as to give members more time to think about their eventual candidatures. As you may be aware, this year 3 out of 7 Board members will end their mandate and 1 will be replaced following his decision to step down. 4 new Directors of the Board will be then elected. Here below a recap of our Board members. Please find here the official invitation and rules to candidate yourself as Board members. Should you want to have more information about the role of the Directors, please do not hesitate to contact Francesca Giubilo at coordination@wfto-europe.org, or Giorgio Dal Fiume (giorgio.dalfiume@altromercato.it). Fair Trade & Migration: Where is the link? This year, WFTO-Europe introduced an Annual Topic for the first time ever. The topic of 2017 was chosen to be “Fair Trade & Migration”. In connection to this, WFTO-Europe conducted a study on WFTO-Europe members’ perception of the topic to assess whether a link exists between these two issues. 20 organizations from the network participated. Overall, the study showed a common belief that Fair Trade and migration are connected. When asked if Fair Trade has something to deal with migration, 70% of the participants agreed, 30 % partially agreed, and no one disagreed. Participants explained this link with the better economic and social conditions and opportunities in the South provided by Fair Trade, particularly in the rural areas, which discourages migration to the North as well as to the cities in the South. All participants also agreed at certain levels that Fair Trade can prevent economic migration, and it was found that the majority would support WFTO activities on the issue. Nonetheless, although most participants linked the topic to prevention of migration through the creation of economic opportunities, the study also revealed that other migration-related issues can be solved through Fair Trade, specifically in those cases where people must flee from war. The study shed lights on the work WFTO members currently have revolved around refugees. Some members already work with migrant people and have implemented activities targeting migrants. For example, members hire migrants, target migrant countries, make donations to refugee camps and support organizations or campaigns focusing on the area. A concrete example is the ARGE Weltläden who launched a 3-year campaign in 2016, focusing on raising awareness on migration issues and the role of Fair Trade. Moreover, EZA Fairer Handel GmbH got into a partnership with a Fair Trade partner from Thailand, Green Net, who donated rice which EZA distributed to refugees in Austria through World Shops. EZA also supported the Drop Earrings Not Bombs project, which initiates a handmade earring production hiring Syrian refugees. EZA took part of the production of the Austrian line and sold their earrings in their World Shops. These cases show that Fair Trade indeed is linked to the issue of migration. Although Fair Trade ultimate aim is not to solve migration, Fair trade practices, focused on helping those living in the South but also supporting the marginalized people in the North, have strong consequences on migration. In these critical times, our network’s help is needed more than ever. This emphasizes on the relevance and need for involvement on our Annual Topic, which WFTO-Europe will continue to work on within this year. Yesterday, the 24th of April, is the Fashion Revolution Day which marks the anniversary of the Rana Plaza disaster. A factory in Dhaka, Bangladesh collapsed and killed 1,138 people due to unsafe production facilities. The factory hosted clothing productions of popular fast fashion brands, and its collapse is a main reference to criticism of the fashion industry. The fashion industry is one of the most criticized for executing unethical business practices being the second most polluting industry worldwide and with heavy human rights violations in the production stage such as those committed at the tragedy at Rana Plaza. Implementing a sustainable textile supply chain – transparent and traceable, ensuring protection of the people and the planet – remains a challenge due to multiple factors. Among others, our choices to go for fast fashion brands. Fashion Revolution is at the forefront of pushing the industry for a switch that eliminates these critical issues. After the disaster in 2013, a revolution was formed when this global movement was founded through a civil society organization based in the UK. The organization advocates on the topic with a yearly Fashion Revolution Week, starting on the Rana Plaza Tragedy anniversary day, as a part of their global “Who Made My Clothes” Campaign. This week highlights the topic of traceability and transparency in the textile supply chain with the involvement of consumers and actors from the industry. Via social media, organizations will ask companies “Who made my clothes?” whilst producers will answer “I made your clothes”. The campaign sends out a clear message to adopt a responsible consumption and embrace more ethical business practices. WFTO-Europe together with WFTO is supporting Fashion Revolution to promote the Fair Trade Principles that too often are violated in the textile supply chain and to bring Fair Trade Fashion forward. We encourage the entire network to do the same. This is our time to show to the fashion industry as well as to public institutions and international bodies that immediate actions must be taken to solve these appalling abuses. Read the campaign’s official site and join the revolution here. World Fair Trade Day is getting close, and at WFTO-Europe, we are slowly getting ready to celebrate this special day. This year is the third year of WFTO’s Agent For Change Campaign, and once again we are asking people to support our campaign and to form a human chain to symbolize solidarity. Up to the day and on the day itself, we will support WFTO’s social media campaign promoting World Fair Trade Day with the focus on how everyone can be an agent for change and help achieve the Sustainable Development Goals. WFTO-Europe will use the occasion to show how Fair Trade is linked with the Sustainable Development goals, and how consumers can be agents for change by choosing Fair Trade products as well as how our members are agents for change. 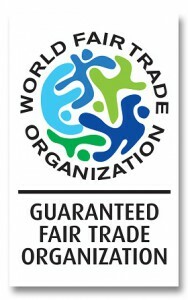 WFTO-Europe will focus its activity around this by organizing an event where all Fair Trade actors in Belgium, member of WFTO and not will be invited to celebrate the World Fair Trade Day and to create a human chain. The event will take place in Brussels on the 12th of May, and during the event, we will create materials to share on our social media on the World Fair Trade Day. To get more outreach, we strongly encourage participation from all of our members 1-2 weeks up to the special day. Please join our social media campaign by sharing our posts and sharing material with us. Make a post explaining why you are an agent for change or how consumers are agents for change when choosing your products. Please do share this with us so we can spread it on our social media. You can also take photos of your organization’s staff forming a human chain as well as photos with the Agents For Change sign. Please share them with us and on your own social media platforms. Remember to use the hashtags #FairTradeDay and #AgentForChange. Find materials and ideas for the message in the campaign brief from WFTO here. Follow any updates on the event on our event page here. 9-13 November 2017: WFTO Global Biennial Conference – pencil it in your diary! The 14th WFTO Biennial Conference will take place on the 9th-13th November 2017 in New Delhi, India. This WFTO Conference is a key moment to gather all Fair Trade actors alongside the supply chain and to shape the future of our big network. The theme of this year’s conference is “Fair Trade, a Path to Sustainable Development”. This occasion will be used to address the topic of the 10 Fair Trade Principles in relation to the Sustainable Development Goals. Speakers include Fair Trade experts from the public and corporate sector who will provide valuable discussion points for the debate on how Fair Trade achieves sustainable development. One confirmed speaker is Nicolette Naumann, Vice-President of Messe Frankfurt/Ambiente. This year, participants will also have the chance to join a track ‘Marketing and Quality Assurance’ at the 2017 Organic World Congress (OWC) which runs at the same time and place. Here, “Fair Trade meet organic” linking organic to Fair Trade as a way to an environmental friendly production for knowledge sharing, networking and synergy building. This is a unique opportunity to engage with actors from the industry at a global level and expand knowledge and ideas on how to get Fair Trade at the forefront of trade and ensure sustainable development through trade. It is a chance to learn from the best and be apart of decision making within the Fair Trade movement. NOTE! : Members that lack means to attend can apply for scholarships from WFTO. Download guidelines here and submit your application through the online form here. The deadline is the 30th of April. Read more on the conference here. We are proud to inform you that right now around 50 Organizations successfully passed through the WFTO Guarantee System while the others are at different steps of the process. At the regional level, WFTO-Europe is processing 4 monitoring applications while we are managing 4 new membership requests. As agreed in the WFTO-Europe AGM in 2015, WFTO-Europe has finalised and made available to European members the list of FT unverified suppliers so as to foster collaboration and synergy amongst the members. WFTO-Europe is pleased to welcome its new members: Siyabonga and Landelijke Vereniging van Wereldwinkels (DAWS). On the 21st of April, WFTO-Europe attended the Journée de partenaires organised by Oxfam in Brussels. This was a great and inspiring opportunity to hear the stories from 3 partners from the Mali, India and Paraguay and meet the people who constantly work on a voluntarily basis to make the change happen! The last board meeting was held on the 4th of April via Skype. Please log in here if you want to access all the Board Meetings held by WFTO-Europe. The next one is planned to take place on 28th of April, via Skype. A lot has changed since Lasse and Tina Elvang brought back Peruvian alpaca blankets from their backpacking trip to Peru in 2002. They fell in love with the beauty, softness and luxury of the alpaca textiles that they found. But they were also overwhelmed by the poverty they experienced around them. They decided to find a unique way to unite a Scandinavian design approach with the pure elegance of the alpaca yarn that would benefit the region in Peru they had visited. Driven by the knowledge gained from working with alpaca came the passion for creating other home textiles with carefully selected producers using the finest fibres available. Elvang strive to create designs that stand the test of time always using the most durable yarn qualities that can withstand everyday use. The current collection includes textiles for your kitchen, table and bath while constantly creating a new look in alpaca cushions and throws as well as luxury scarves. But perhaps what Elvang are most proud of is what have been done for the region of Peru. Elvang has created more than 200 fulltime jobs and educational programmes with their suppliers that have benefited the shepherds, home weavers, knitters and their families. All whilst sustaining an ecological balance and caring for the animals that create the very fibre they take pride in offering to you. And that’s why Elvang Denmark says: “we create textiles with integrity”. The aim is to be able to always look the customers in the eyes. Elvang´s clients are very quality conscious and they choose products where design – quality and material all come together. Positive feedback from clients, who have an Elvang product, which they bought 10 years ago and the product still looks new, is very rewarding. Today, Elvang operate worldwide, among others on the Scandinavian markets, Germany, France, Holland, The States, Japan and Australia and participate in various trade fairs around Europe. This season they met customers from all over the world at Ambiente in Germany and at Maison & Objet in France. To meet clients and to present new designs is always very exciting for Elvang. Textiles is Elvang´s universe and they continually extend the product range with focus on products made of only the best possible quality. These chimps need a home. Due to climate change experienced by producers in Sri Lanka, the production did not meet the buyer’s deadline (a zoo company). Materials from elephant dung did not dry on time for production due to torrential rains.